A Plymouth hotelier has made a formal complaint over a poster campaign which suggests city hotels "fleece" their customers. 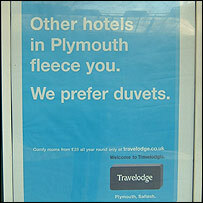 Travelodge has put posters up in the city saying: "Other hotels in Plymouth fleece you, we prefer duvets". The company says the advert was never intended to offend anybody and that it was meant in a light-hearted way. But Phil Collins claims the posters are in poor taste, and the Advertising Standards Authority is investigating. Travelodge, which recently opened a new hotel in Plymouth, said the advert was designed to make potential customers aware that the chain offers duvets rather than fleece blankets. But Mr Collins, the chairman of a consortium of hotels and guesthouses in Plymouth and the owner of the Devonshire Guest House, has been outraged by the campaign. He said the posters were inaccurate as most hotels in the city used duvets anyway, adding that the advert suggested hoteliers were ripping off their customers. "When you arrive on a train and the first thing you see is massive billboards greeting you with 'Plymouth hotels fleece you', then who knows what the impact will be? "To the Travelodge it's just a humorous statement and a play on words, but to the dedicated guesthouse and hotel owners of Plymouth it's more than a play on words. "It's derogatory, so therefore we're not happy," he said.